This project, our second in Manhattan Beach has views of the ocean just blocks away. Lots in this part of Manhattan Beach are exceptionally narrow and long. This, coupled with highly specific zoning rules, leads to consistent architectural outcomes, regardless of the style. Within this framework we sought to develop the front facade as a group stacked staggered openings, with the doors pocketing into walls on the lower two levels, the opening at the top level orients to the ocean views. On the interior we created a double height space at the core of the house that functions as a family study and is critical in breaking up the pancake effect common to homes in this area. 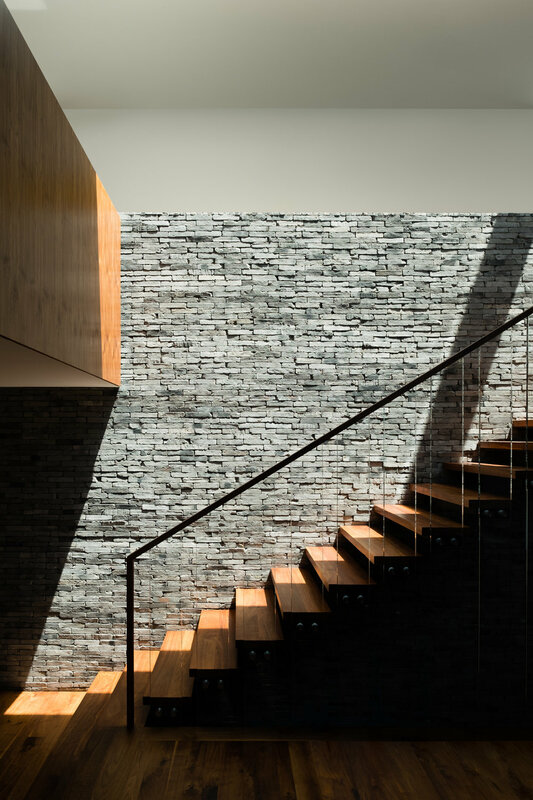 The floating stair wall in the core of the house in built on all sides from reclaimed brick from China.